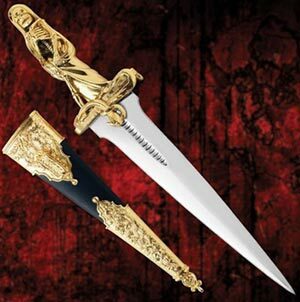 Dagger of Azrael for sale is modeled after a 19th Century dagger that was made in France. The Azrael Dagger is 18 inches in all with an 11 inch blade. The blade shape is similar to ancient Egyptian willow leaf designs. The fittings are plated of genuine 24kt gold. Designed in homage to Azrael, the Archangel of Death, the handle features a 3D cloaked skeleton with a serpent wrapped upon the guard. This popular dagger also includes a lined coffin-shaped box for display. The matching scabbard features exceptional filigree metalwork for the fittings and black leather. The dagger weighs approximately 1 ½ pounds. Buy the popular and beautiful Dagger of Azrael for $189.99 .